The Yankees spent the majority of the second-half without Aaron Judge’s potent bat in the lineup, or his steady glove in the outfield, and they undoubtedly suffered for it. And it isn’t just because of his brilliance, either – they simply weren’t equipped to handle a prolonged absence in the outfield due to injuries and trades that left them more than a bit shorthanded. Journeyman Quadruple-A outfielder Shane Robinson and not-even-an-outfielder Neil Walker manned right-field for the month of August, and it wasn’t pretty. The team’s biggest position of strength had become a weakness and Judge’s return was continuously pushed back, and the team was giving away outs with the bat and in the field as a result. That is, until Andrew McCutchen arrived. 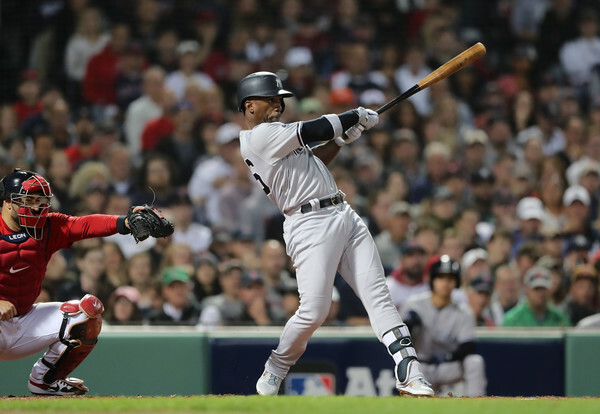 In the hours leading up to the waiver trade deadline on August 31, the Yankees sent RHP Juan De Paula and utilityman Abiatal Avelino to the Giants for McCutchen. Mike Axisa didn’t have either prospect among the Yankees top-30, so it seemed like a reasonable price to pay for a month (and postseason) of a still-productive outfielder. Sure, there were questions about his fit once Judge returned – but, given the nagging injury to Giancarlo Stanton, the lack of production from Brett Gardner, and the question marks around Judge’s return, that seemed rather inconsequential. McCutchen was hitting .255/.357/.415 (115 wRC+) with the Giants prior to the deal, with an excellent 12.9% walk rate and average-ish defense in right-field; that latter part is worth noting, as he had only played 115.1 innings in right before moving there full-time this year. His offense was a far cry from his brilliant peak of 2012 through 2015, but it was in-line with his still solid 2016 and 2017 seasons – and maintaining that would be more than enough to justify the move. Thankfully, McCutchen would be much better than that. McCutchen made his Yankees debut on September 1, and he didn’t look great in going 0-for-3 with 2 strikeouts and a HBP. He went 0-for-4 with another HBP the next night, and scored his first run with the team. His first hit came the following evening, when he went 1-for-4. It was a bit disappointing to see McCutchen hit .091/.231/.091 in his first three games in the Bronx, but it was understandable that there would be an adjustment period. And those three games represented the entirety of said adjustment period. McCutchen ranked 6th in O-Swing%, 16th in Z-Swing%, and 9th in overall Swing% in September, all of which are elite placements. Moreover, the league-averages in those rates are 30.9%, 67.3%, and 46.6%, respectively, which shows you just how disciplined he was down the stretch. And, while some may be inclined to call him ‘passive’ instead of ‘patient,’ it’s worth nothing that his 149 wRC+ in the month as a whole was 22nd in baseball, so he did plenty of damage with the bat on the whole. McCutchen was straight-up bad in the playoffs, going a combined 2-for-18 with one walk in 19 PA between the Wild Card game and the ALDS. Aaron Boone had him on the bench for the fourth (and final) game of the ALDS, only bringing him in to pinch-hit against Chris Sale in the eighth … and he grounded out to third. And, once again, he had a 115 wRC+ pre-trade. There was nothing beyond that uptick in discipline in his underlying numbers to explain his strong performance. McCutchen’s BABIP dropped, he hit fewer line drives and flyballs (which in turn means more grounders), his exit velocity remained roughly the same, and his hard-hit percentage dropped a couple of percentage points. And all of this suggests that his 20.8% HR/FB might just be the flukiest part of his performance – which doesn’t exactly bode well for a team that chooses to bet on his contributions to the Yankees as representative of his current skills. But a corner outfielder with great plate discipline and decent to good power has value. It’s difficult to see a return engagement with the Yankees, though. McCutchen is almost certainly looking for a longer term deal and a guaranteed starting role, and I don’t see him as the sort of player that Brian Cashman and Co. would give either of those to.